This entry was posted in Chickens, Fruits and Veggies, In the Garden. Bookmark the permalink. I’m feeling a pang of envy for those fresh winter veggies right now. It’s very slim pickings here in Virginia right now, but the good news is that Spring is coming fast. I enjoy seeing what you’re harvesting. Thanks for posting it. Hold out for Spring, Bill! In the past few days I’ve spent some serious time at our allotment weeding the bed of leeks and pruning raspberry canes as well as giving a serious talk to the kale and savoy cabbages about their lack of progress no doubt due to a particularly cold spell of weather in February. 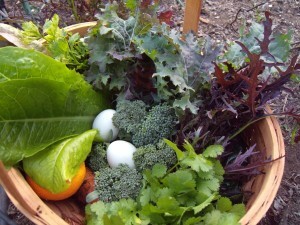 Then I see your harvest which is more than impressive although I think your chooks need some encouragement…. 7 eggs in a month can’t possibly be paying for their keep or have they, like mine, become more pet than livestock! I look forward to seeing how productive February was and what sort of goodies you managed to harvest. Are you still suffering a drought? Hi Jackie–The chickens finally picked back up, and we suddenly have eggs coming out our ears! I doubt they ever earn their keep, but they are dear to us, and their eggs are delicious. If only we had more space and could double or triple our flock, I suspect they’d come much closer to paying for themselves. I’m much too busy as always, and am late posting February’s harvest. The best part was all the honey! So much more spring honey than we’ve ever had, and only one of our seven hives died during the winter! Happy allotment weeding, and good luck to your kale and savoy cabbages! The drought persists. It’s awful. More soon! I love this concept, to know how much your bringing in from the garden, and assigning a monetary value makes it even better! But the logistics of this seem like a nightmare! Then again, I JUST started labeling my jams and canned goods, so I’m not great with records….any tips on how to make sure everything gets weighted and recorded? I get some kind of nerdy joy from keeping these records, and without this motivator, I’m pretty sure our record keeping would go to hell. That said, we have implemented a system in the last few years that makes it a bit easier, and it also gets easier with habit over time. Here’s the method: We devote a full-sized calendar to recording produce weights, and hang this with magnets on the fridge. Every time we bring in a harvest, we weigh it in the hanging produce scale by the backdoor, or on my new digital scale (does a better job at accurately capturing the small stuff). Then I make a point of immediately jotting down the weight on the calendar. At the end of the month (or more often halfway through the next month! ), I sit down with a calculator and add up the totals for each variety. It’s only this year I’ve started calculating prices. This is definitely a pain. I have become the ridiculous person in garden clogs and ratty t-shirt at 9pm, who stumbles into Whole Foods with my calendar and ballpoint and proceeds to jot down price-per-pound in the produce section. Turns out things sold in bunches generally weigh half a pound ;). Who knew? If/when I have more time, I’ll head out to the farmers market and use those prices. The whole record-keeping thing is a work in progress, but I actually find that having these numbers motivates me to be more on top of my gardening in the midst of all my other obligations.